The new Launcher CBX Irons from Cleveland Golf feature a cup face design, V-shaped Sole, and Tour Zip Grooves to deliver maximum distance with wedge-like accuracy. Large, easy-to-hit long irons transition to compact, easy-to-control short irons, helping you get closer to the hole from anywhere on the course..
TOUR ZIP GROOVES AND LASER MILLING PUT TOTAL CONTROL IN YOUR HAND - Laser Milling roughens the face which increases friction and enhances spin for wedge-like control. Tour Zip Grooves channel debris away from the ball so you get consistent spin and control in the fairway, rough, or sand. PROGRESSIVE SHAPING IS THE BEST OF BOTH WORLDS: DISTANCE AND CONTROL - Launcher CBX long irons use a thicker top line and low profile to give you maximum distance. Launcher CBX short irons use a compact shape and thin top line to provide more control. 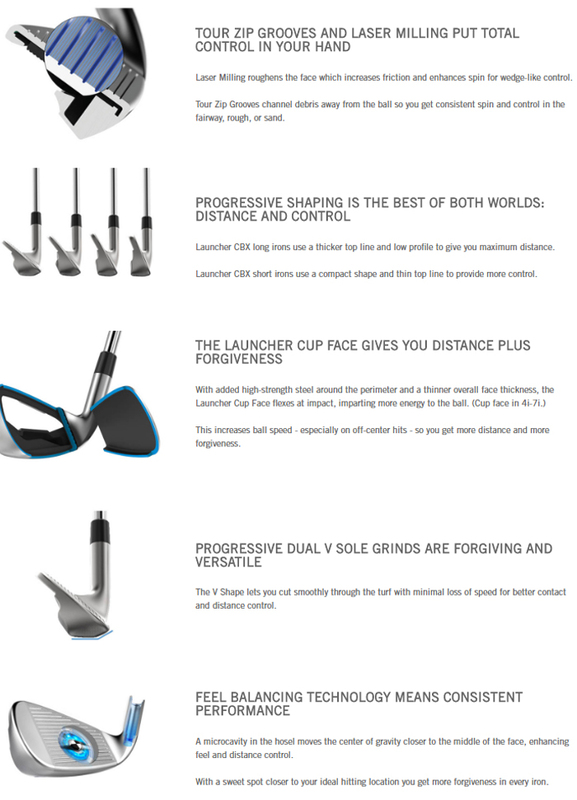 THE LAUNCHER CUP FACE GIVES YOU DISTANCE PLUS FORGIVENESS - With added high-strength steel around the perimeter and a thinner overall face thickness, the Launcher Cup Face flexes at impact, imparting more energy to the ball. (Cup face in 4i-7i.) This increases ball speed - especially on off-center hits - so you get more distance and more forgiveness. PROGRESSIVE DUAL V SOLE GRINDS ARE FORGIVING AND VERSATILE - The V Shape lets you cut smoothly through the turf with minimal loss of speed for better contact and distance control. FEEL BALANCING TECHNOLOGY MEANS CONSISTENT PERFORMANCE - A microcavity in the hosel moves the center of gravity closer to the middle of the face, enhancing feel and distance control. With a sweet spot closer to your ideal hitting location you get more forgiveness in every iron. Grip: Cleveland Stock Ladies Grip.